Most of you might have taken medications for an illness big or small at some point in your life. Be it allopathic, homeopathy, ayurveda, siddha or any other, medicines are important to cure ailments and must be taken with a qualified medical specialist's guidance or prescription. What is the medicine for? Are you taking it for an illness or a symptom or as a supplement? How long will it be before you see signs of improvement? Would there be any side effects or side benefits of the medication? If yes, what are they? Is the medicine expensive? If you cannot afford it, is there an alternative? If you're taking more than one medication, are there any possible drug interactions? If yes, what should you watch for? Are there any work or lifestyle restrictions with the medications? Do you have to watch your food intake or physical activity? What are the timings for medication? For how many days is the prescription? If there's no need for a follow-up consult with the doctor, when should you discontinue the medicines? If you travel, should there be any changes in medication or can you continue the same? 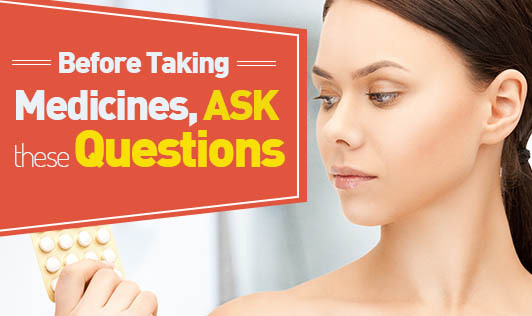 Don't be afraid to ask questions when you consult your doctor. Get all your doubts clarified before you leave the room. You have every right to know about your health status! Do not self-medicate. Do not take medicines based on the ‘advise' or experience of a relative, friend or a colleague. Remember that each individual is different and what may be appropriate for one person may not be good for another.